Conceived as Jon Anderson's attempt to break out of the strictures he felt the recent Yes albums (90125, Big Generator) had placed on him, this was a project which involved former members of Yes coming together to record what was essentially a new Yes album done the "old Yes" way. You can tell by the names who were in the project - Rick Wakeman of course, legendary keysman on some of Yes's best albums, Steve Howe, who left to join Asia, and drumming icon Bill Bruford from King Crimson. Contractual and copyright problems prevented the new supergroup from using the name Yes, so after some brainstorming they decided the safest option was to just use their names. Makes for a long album title, but hey, like everyone else, we'll refer to them from now on as ABWH, okay? I seem to recall I bought this album on the strength of the cover alone (though of course I knew the names of the performers, so knew what the music was likely to sound like) - who wouldn't, with that fantastic Roger Dean artwork, which certainly appealed to someone who was getting into the likes of Frank Frazetta and Boris Vallejo? I bought this on vinyl originally, and it was presented in a beautifully lavish gatefold sleeve. To be honest, I had never been a huge fan of Yes, but I had enjoyed the last two albums, and I liked Rick Wakeman's work. I was also familiar with Anderson's collaborations with another of my favourite artistes of the time, the singularly talented Vangelis. So it wasn't a difficult sell as far as I was concerned. But the needle tells all (sigh! Ask your parents, willya? MAN I feel old! ), so what sort of music have we here? There's a deceptively gentle opening, tinkling piano as Wakeman introduces the first piece of music, and you feel yourself settling back. BAD idea! Within a few moments Bruford's drums come crashing through, the pace jumps to about third or fourth gear, and the first song is well into its stride. 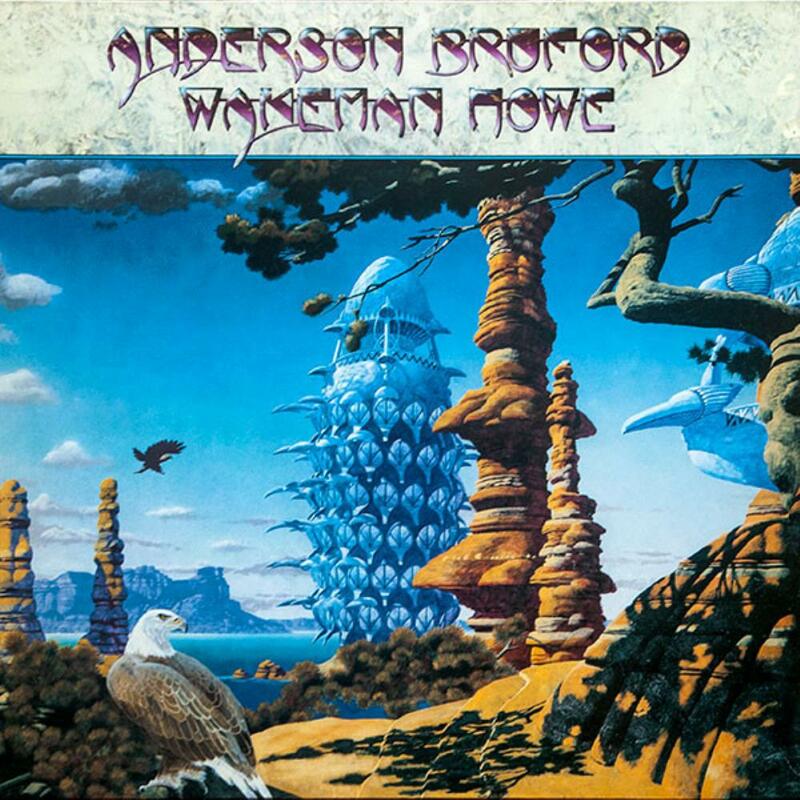 The clear, piercing voice of Jon Anderson dispels any initial belief that this may have been an instrumental. As it goes, ABWH is broken into four multi-part compositions, with some self-contained complete tracks complementing these larger works, but all seems to feed into the one overall concept, and the album plays very much like one huge slice of music, almost an hour in length. The aforementioned piano intro is called "Sound", and forms the first of a triplet of songs that make up the first composition, called "Themes". As the drums kick in and the singing begins, we're into "Second attention", which goes on for about half the track. Really, it's a bit fatuous to call "Sound" a third of the track, as it's really nothing more than a piano intro, a few seconds long, not even a minute really, and the rest of "Themes" is divided between "Second attention" (the larger part) and "Soul warrior", which is totally instrumental, and runs for just over a minute and a half. The next track is a self-contained one, just over three minutes long. "Fist of fire" is much slower, heavier and darker than the previous. There's a real sense of the ominous about this: stabbing keyboards, thumping drums and Anderson's urgent vocal carrying the track. "Through the darkest age/ We could surely fly/ Through the darkest age/ With the fist of fire." There are some great keyboard solos by the Wizard King here, good backing vocals too (multi- tracked?). This leads into the second multi-part composition, called "Brother of mine", on which Asia and ex-Yes keysman Geoff Downes lends a hand with the writing. The whole thing starts off with a gong sound and then a slow, soulful intro: "So, giving all the love you have/ Never be afraid/ To show your heart." It opens with "The big dream", a jaunty romp which takes us up to "Nothing can come between us", where the song speeds up a bit and the theme from "Brother of mine" is repeated, as happens throughout the multi-parters. Nice guitar work here, before things really take off for the final part, "Long lost brother of mine", which brings the piece full circle. The way the parts of the multi-compositional pieces meld and flow together effortlessly makes it somewhat difficult to note where one part ends and another begins, and there's definitely no gaps as the parts slide from one to another like tributaries of a river coming together. It's not a criticism, nor is it a problem when listening to the album, as the music is so uniformly brilliant that you really cease to care what one section is called, and just really listen to it as one continuous piece of wonderful music, four legends at the very pinnacle of their game, consummate professionals working not to outdo each other, but to come together in such a way as to almost become one single entity, dedicated to producing the very best music they can. After the multi-layered "Brother of mine" there's a single track, but no less brilliant in its way. "Birthright" has a dark, brooding tone, with a steady drumbeat, and seems to be about the American War of Independence: "This place ain't big enough/ For stars and stripes/ This place ain't big enough/ For red and white." About halfway through it morphs into something of an Irish jig, and gets a little faster as it approaches its conclusion. The song is really a vehicle for Steve Howe's guitar, and does he dazzle! It's followed by one of only two ballads on the album, the gently understated, almost hymnal "The meeting", where Anderson and Wakeman bring things down to a whisper with one of the nicest songs I've heard in a very long time. The gentle piano perfectly complements Jon Anderson's choir- boy voice, and yes, there is something spiritual about the song, even in the lyric: "Surely I could tell/ If you asked me, Lord/ To board the train/ My life, my love/ Would be the same." It closes the first side of the album in gentle triumph, almost a lullaby, fading slowly away but remaining in the ears long after the last chords have been played, and the last notes have receded into the night. Side 2 kicks off with another multi-composition, under the banner heading of "Quartet". Featuring, yes you guessed it, four parts, it starts off with "I wanna learn", a boppy, joyful, almost childlike song about discovery and wonder, as Anderson cries "I wanna know more about life/ And things that can fly in between my mind/ I wanna change all that I dream about/ My waking and my so many lives." It's relatively short, about two minutes, but then the whole track is just over nine, so with four sections about two per section is right. Second part is "She gives me love", keeping the happy theme going and essentially continuing on the same song. Anderson cheekily namechecks one of the old Yes songs as he sings "Through the gates of delirium so fast..." Apparently there are other examples of this throughout the album, though not being a 70s-era fan of Yes I couldn't point them out for you. "She gives me love" seamlessly becomes "Who was the first", which is almost exactly the same melody but with different lyrics, until the climax of the track is reached with "I'm alive", where the theme from "The Meeting" returns, to slow the track down and bring it to a gentle and very satisfying close. Luckily things are soon back on track for the final multi-composition, as "The order of the universe" takes the album towards its ending. Another nine-minute piece, it kicks off with a powerful dramatic instrumental which goes under the title of "Order theme", before the main part of the song, "Rock gives courage" blasts in, a real hard-rocker in the mould of (sorry guys, I know you don't want to relate to 90125 but...) "Owner of a lonely heart" or "Our song". Things speed up then for the third part, "It's so hard to grow", reintroducing the central theme: "You can't imagine it/ How hard it is to grow/ You can't imagine it/ Can you imagine/ The order of the universe?" The remaining part, called "The universe" is basically an instrumental ending to the song, a retracing of the introduction. As side 1 ended with a lovely little ballad, so does side 2, and indeed the album, come to a relaxing close, particularly after the histrionics of "The order of the universe", with a beautiful little acoustic number, on the composition of which Anderson's old mate Vangelis lends a hand. It's VERY Jon Anderson: "Let us be together/ Let's pretend that we are free/ Let's all be where the angels find us/ We all have the key." There's minimal or no percussion in the song, and it's just Steve Howe and Jon Anderson finishing the album off in fine style. "Something that I feel/ To pour upon my soul/ Countenance of love/ For one and all". Amen, brother. There never was another ABWH album. Two years later the two "sides" of Yes resolved their differences, and the result was Union, released under the Yes banner. Although some of its music is similar to ABWH, there are no multi- part pieces on it, and it's not a concept album, so although it is regarded in some circles as the 2nd ABWH album, to me it's a Yes album, pure and simple. An excellent one, it has to be said, but for all that, a Yes product and not a continuation of ABWH, although some songs on it were supposed to have found life on the projected follow up to ABWH. In this manner, I consider ABWH the album to be something of a rarity: unique in that it is at once an album by established members of a band, a new supergroup and a debut all in one, and is the only recorded example of this partnership (setting aside live recordings). For this reason alone it deserves to be listened to, and appreciated.